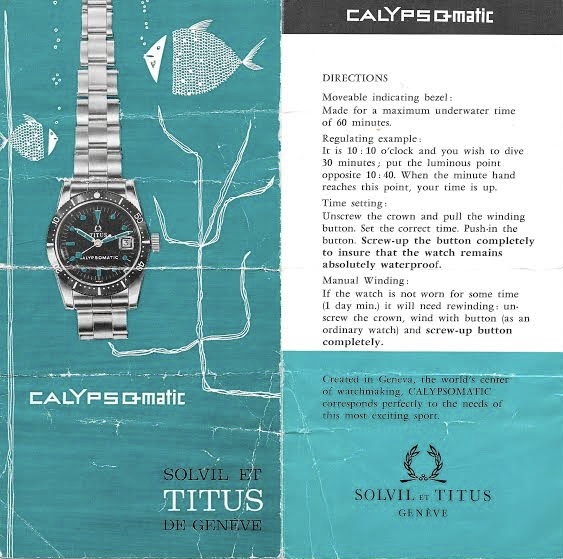 "The best watch money can buy"
As a longtime passionate Titus Calypsomatic collector I chose to do this comprehensive review on this beloved reference as a resource for others to enjoy and learn from. Over the years I have received almost weekly questions, checks or for sale inquiries about the Calypsomatic. The references that will be discussed here are the ones I personally collect which are the first generation Calyposmatics and all full size gilt (gold writing) models with the lollipop hour hand. This information is compiled from my extensive personal experiences with Calypsomatics, online resources/forums and conversations with fellow enthusiast around the world. Special thanks to John and Fred for their shared passion for this brand. 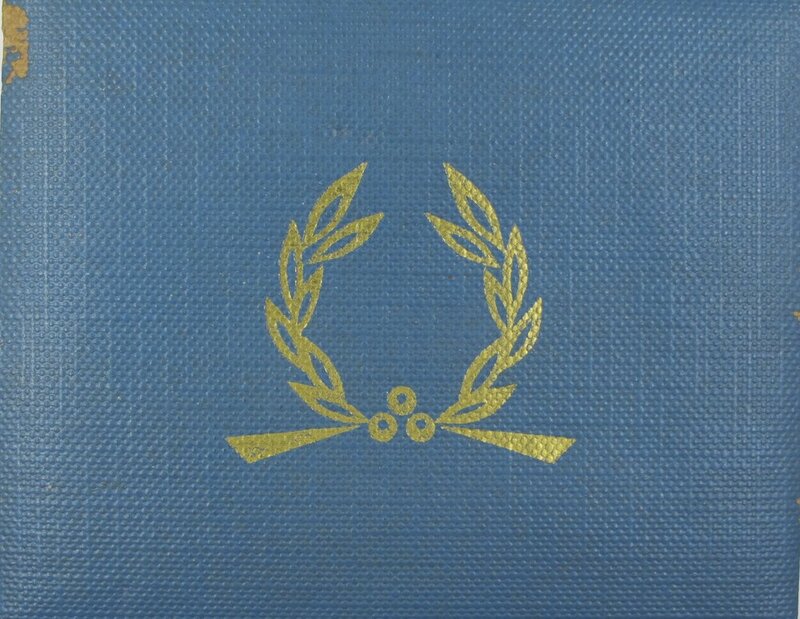 *The Titus Logo is a Laurel leaf. Often associated with achievement or victory. It is two identical leaf ends shaped into a circle. 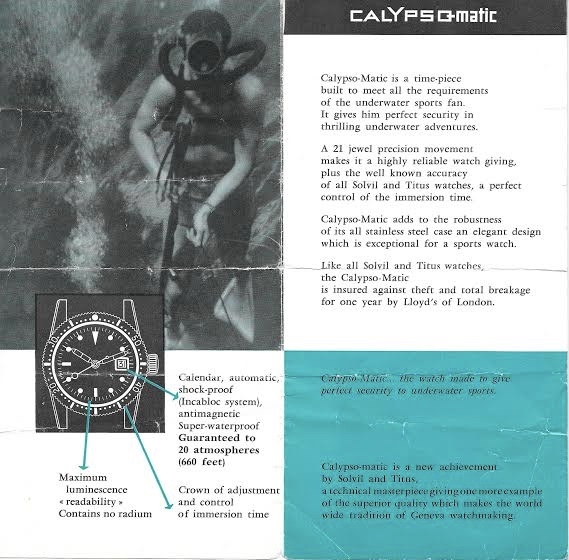 "Calypso-Matic: The watch made to give perfect security to underwater sports." The Titus Calypsomatic was first introduced in the early 1960’s, likely between 1960 to early 62 and successfully ran in production through the early 70's. 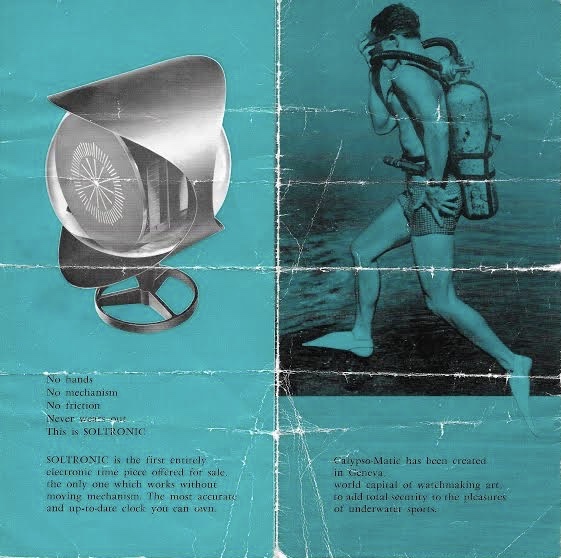 The 60’s were the golden years for vintage divers as many would call it. With the significant increase in commercial work in the ocean and seas the demand for well made, robust, waterproof watches took off. This created a field of strong competition and demand and as a result some of the best dive watches were produced in the 60’s. Like other brands looking to compete in such a booming industry, Titus introduced the beloved Calypsomatic. Below is an old brochure that I physically own. I have never seen another. The name Calypso-matic is one that often people find to be "cool" with a great ring to it but the origin of the name is still a bit of a mystery. I will try to present a case that I believe helped Titus create this great name since Titus never publicly explained its origin. During this era Jacques Cousteau was a very prominent figure, especially for under water diving both for personal and commercial activity. He essentially was gifted what was originally an old 40's British military WW2 ship that was used for minesweeping, which was later converted to a ferry and then refurbished and transformed by Cousteau into an expedition vessel to be a support for base diving, oceanographic research and even filming. 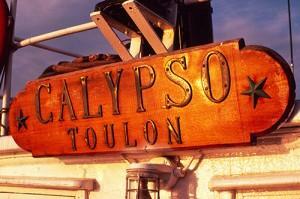 During this transition the ship was named "Calypso" after the greek mythological character. Which in greek also mean, she who conceals. So by the time the 60's began, the name "Calypso" was already well known and documented and I am sure Titus was familiar with Cousteau and his ship and this could have inspired the first part of the name "Calypso". Adding the "matic" at the end was likely because the watch housed an automatic ETA movement. The word auto-matic broken down simply means "willing to self-perform". * During this time period the automatic was still a big deal and was a significant selling point in advertisements. In the brochure above you can see that they sometimes show Calypsomatic broken into two as Calypso-Matic. *Cousteau aboard his beloved Calypso ship. *The ships logo named after the greek mythological character. The first execution for the Calypsomatic was the reference 5913. The gilt print stopped being used around 1967 along with the famous lollipop hour hand. The reference 7985 was the last with this complete configuration and you see the changes immediately with the following 7986 reference. *transitional (very early) 7986 references may have a gilt dial and if you are lucky still the lollipop hour hand but its unlikely in most cases. *Titus also made co-branded Calypsomatic models for Dacor but they are not gilt and have mercedes hands. While there are multiple different cases for the Calypsomatic from women, mid size, full size and a cushion case, I only collect the full size which I believe is the most collectible. This case is beautifully designed and was shared amongst a few other models such as the Universal Geneve Polerouter Sub and the Technos Sky Diver just to name a few. As a utilitarian watch it has the practical drilled lug-holes and pointed downward bending lugs that wrap nicely over the wrist. Thickness for most models: ~13-13.5mm thick from top of the crystal to center of the case-back. The long dimensions from the top lug to the bottom is what gives the watch a strong wrist presence and feels much larger than the ~37mm or most commonly seen listed 38mm diameter. Ref. 7985 (left) is listed at ~38mm Rolex 1665 DRSD (right) is listed at ~40mm diameter. Notice the length of the lugs from top to bottom. The Calypsomatic uses an ETA2452 for the first generation and the ETA2472 movement for the rest. The 2472 is a mechanical movement with automatic winding, date display with semi-quickset feature, and power reserve of 42 hours.